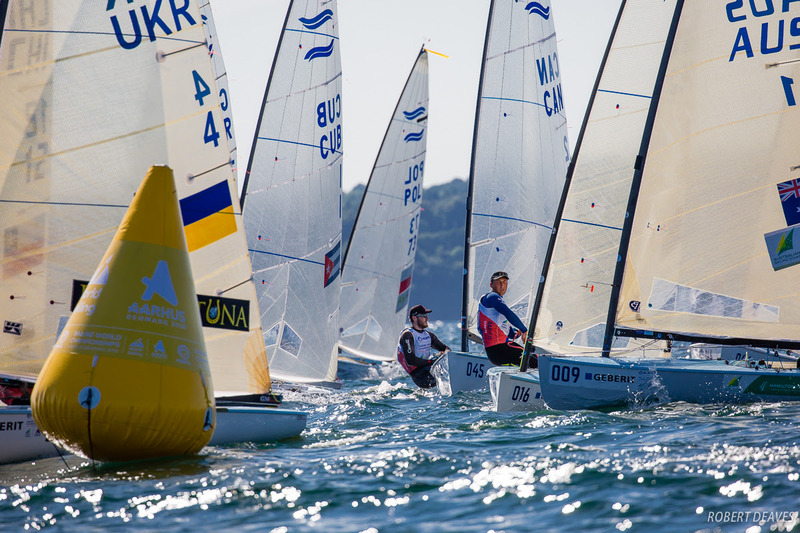 The Hempel Sailing World Championships 2018 in Aarhus, Denmark for the Finn Gold Cup got off to a slow start on Thursday after only one race was possible as the gradient and thermal breezes fought all day long. When the sea breeze finally won late in the afternoon, Jorge Zarif and Josip Olujic took the race wins in their groups after a shifty race in 8-12 knots of wind. Finally at around 4pm, a sea breeze became established onshore and the racing got underway. Blue group had also been brought out and the fleets sailed one race, with a 10-minute gap between starts. In Yellow group, while most of the fleet favoured the left, the leaders emerged from the right. After almost being cut in half by a media boat out of the start it was James Dagge from Hong Kong leading at the top from Dave Shilton, from South Africa and Can Adurak, from Turkey. Dagge, in his first full year in Finns, managed to hold onto his lead downwind and up the second beat. 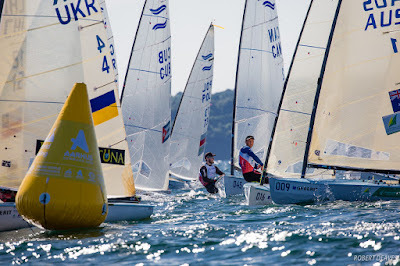 However, with Oscar raised at the top of the second upwind could he not hold off Zarif, from Brazil, and Guillaume Boisaard, from France. In Blue group, Olujic also went right and led round the top and was never headed. He was followed round by Lukasz Lesinski, from Poland, and Joan Cardona Mendez, from Spain. While Lesinski slipped back Cardona held on for second and the defending world champion Max Salminen, recovered to cross third. However the major story of the day was the outstanding performance of the sailors that were part of the Emerging Nations Program. Eight sailors had received assistance and training before the worlds. One of these was James Dagge who led most of his race, but also Dave Shilton and several others put down some markers today.